Want a one-in-six chance of landing a Michael Jordan autograph? 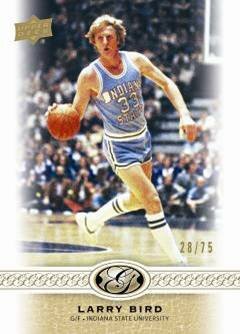 Look no further than the ultra-premium 2011 Upper Deck All-Time Greats Basketball. 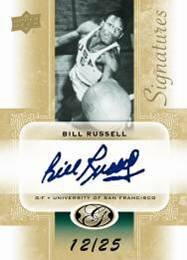 Some of basketball's greatest stars from today and yesteryear are on display for this set that boasts player-specific packaging and all on-card autographs. The set's 20-player checklist is filled with big-name stars, although some would argue that a couple don't necessarily belong. Each tin is player specific, meaning all cards feature the same player. All autographs are on-card and hand numbered. 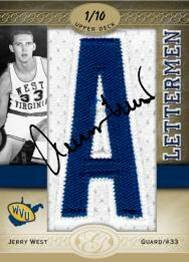 Legacy Book Cards pair autographs from living stars with cut signatures of deceased legends. Examples include Michael Jordan and Pete Maravich, John Wooden and Bill Walton, and Chick Hearn and Magic Johnson. One-on-One Dual Signature Book Cards. Outer boxes will hide the player theme of the pack. Inner packs will show the featured athlete. Some mystery packs will have more than one player.